The WaterLase combines water, air and laser energy for safe use on human tissue in the mouth. Our teeth are partially made up of water and when the laser makes contact with the tooth it excites the water molecules to cut through the tooth. 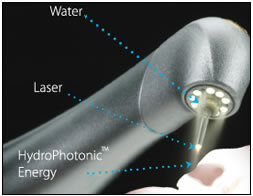 Since the laser continuously sprays out water it keeps the tooth hydrated preventing heat and giving you a virtually pain free experience. 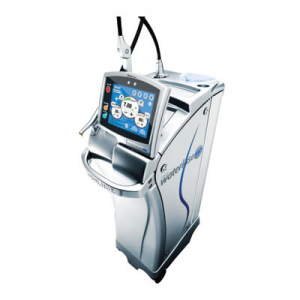 Lasers for use in dermatology, ophthalmology and cosmetics have been around for years and so has the WaterLase. Approved by the U.S. Food and Drug Administration in 1998, the WaterLase is cleared for numerous procedures and can be safely used on all ages. WaterLase is very precise! Regular dental drills rely on removing large amounts of tooth to get the job done, and the constant grinding and spinning of a drill bur can cause cracks and pain. The WaterLase, on the other hand, removes very precise amounts of tooth, without damaging or cracking the rest of the tooth! And because it is so precise, you will rarely need anesthetic! For a dental choice that is both safe and precise, choose a WaterLase.